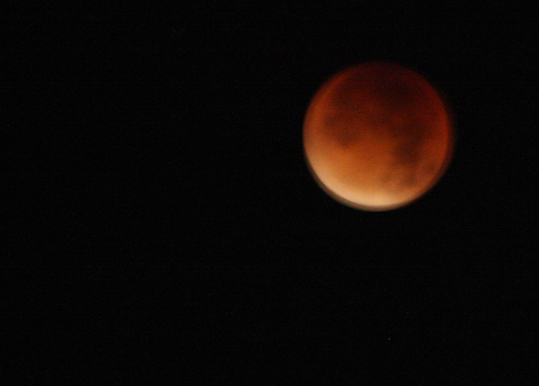 Here's a photo of Blood Supermoon taken at 3.30am this morning from my kitchen window. I decided to set my alarm to see it, but then also woke up just before 2am, just as the eclipse was starting too. I had a look and then went back to bed to get a bit more sleep. Very pleased to have witnessed this rare astronomical event even if my photo of it is a little blurry. Fuzzy or knot, it's a fine picture. I got 30 seconds in a partial break in the clouds at totality. Didn't even try. I've photographed enough of them not to mind missing one or two. Still waiting for Monday, August 21, 2017, 16:48:33 GMT (Greenwich Mean Time) when the solar eclipse crosses the USA. We live 2 hours from the path of the shadow.